Did you know students and teachers can access and create lessons in Discovery Education Streaming? Are you aware of the thousands of resources aligned to the learning standards? Build STEAM in your school! Come learn on Wednesday, June 3rd the STEAM features available to you and your students from DE Streaming. Review the Teacher Tools, Atlas, STEM resources and Learning Management System too! Explore the Builder Tools; Board Builder, an Online Poster, Quiz & Writing Prompt Builder, along with the Assignment Builder. Learn how you can integrate these online, curriculum resources and share them with students and staff today! College credit available upon request. Registration is open. Presenter Tina Lauer is the instructional technologist and assessment coordinator in the St. Charles R-VI School District. She is also an adjunct professor at Lindenwood University in the School of Education. Tina is a Discovery STAR educator, Google Certified Teacher and Google Education Trainer. She has presented at several local conferences including the METC Conference and the MO Summit featuring Google for Education. Learn from her expertise this summer! Virtual Conference sessions include those from Library Media Specialists Gwyneth Jones (keynote), Angela Van Batavia (spotlight educator) and Jennifer LaGarde (featured speaker). 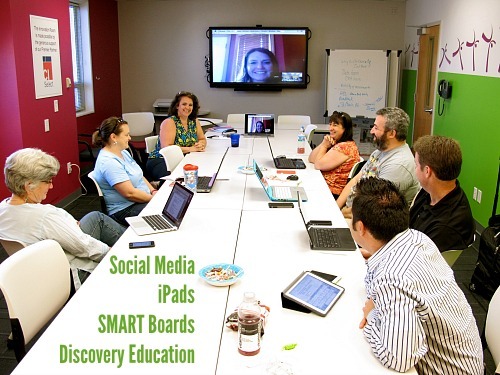 The METC 2015 Virtual Conference consisted of live programming on February 10 and 11 during the edtech conference. Those same sessions are now archived for streaming at your convenience. The presentations chosen include those from keynote and featured speakers as well as Midwest Spotlight Educators. Streaming services were provided by Conference Technologies, Inc. The METC Conference Moodle is provided by SqoolTechs, LLC. Login, Countdown to Student Success, Increase Your Google APPtitude and be a Library Marketing Genius like Lady Gaga! Want to do more with student creations and bring class content to life? Augmented Reality (AR) is your solution. AR provides educators with the opportunity to create a whole new level of semi-virtual and semi-real learning environments. This workshop will engage participants in the technical use of AR apps like Aurasma, Layar, Chromville and provide support for designing learning experiences. AR affords opportunities to curate digital products, create dynamic supports for learners and bring a new dimension to existing teaching strategies. BYOD: Mobile device (Apple or Android), either tablet or smartphone. Learn how to integrate multimedia into your classroom with Discovery Education (DE) streaming including Board Builder, a unique tool that allows your students to digitize book reports, science projects and more. The DEN Star presenters will spend the morning on how to best utilize the resources of DE streaming in your classroom. During the afternoon attendees will learn how students can curate, create and synthesize content using Board Builder. The group will then go head to head on who has created the most DENmazing Board! The transformational power of student work being shared globally changes students’ views of themselves and the world. We will explore why blogging is transformational and will walk you through setting up your own free class blog using kidblog.org. Special attention will be paid to privacy and safety online.